With smartphones, tablets and other portable devices rapidly becoming more widespread, enterprise mobility has now become the name of the game. A large number of workers/employees are now bringing Mobile Phones into their workplace for personal and professional uses. Mobile business apps allow workers full accessibility to real time data wherever and whenever they need it thereby enhancing both employee as well as organizational productivity. 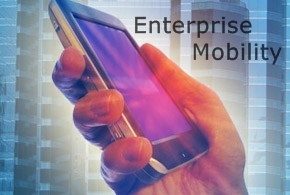 With employees demanding greater connectivity and the flexibility to work from different locations, many organizations are now adopting the enterprise mobility strategy instituting bring-your-own-device (BYOD) policies or allowing employees to select from the already available choose-your-own-device (CYOD) options. Mobile App Development firms are ramping up their efforts to develop business specific mobile apps to meet specific vertical needs. For instance, hospitals, clinics usually prefer electronic medical records (EMRs) to store and track medical and clinical data while retailers hugely rely on mobile apps that help manage their inventory and logistics more effectively. Facilitating both customers and employees with mobile apps that can provide better service faster can strengthen customer satisfaction and loyalty. Organizations can implement enterprise applications by developing customized mobile apps for their mobile phones, IOS, iPhones, iPad’s etc. Developing or adopting cross platform mobile applications that cover OSes Android, Blackberry, Windows, J2ME is a viable alternative to ignoring one mobile IOS to another. Backed by 7+ years of offering exemplary mobile application development services delivering high-end mobile projects to our global customer base, We at V-Soft have expertise on all major mobile platforms (which include iOS, Android, Blackberry, Windows and J2ME) and with our talented development teams, we are confident that we can deliver any mobile project; from custom applications, to education/eLearning apps, to interactive mobile gaming applications. Another viable alternative is Desktop virtualization aka Centralized computing which enables end users the flexibility to access enterprise mobility applications from any device just through a single login. Here, each user retains his or her instance of desktop operating system and applications but the stack runs in a virtual machine on a server. Enterprise mobility can help your business move forward through the virtual workplace, allowing users the ease to access applications anytime and from anywhere thereby enhancing and optimizing employee productivity and business outcomes/sales/targets. With cutting-edge mobile expertise and our competitive rates, we, at V-soft, look forward to supporting you on all your mobile initiatives.